Turmeric, lemon and ginger make an awesome trio. We already learned that with the famous anti-inflammatory lemon ginger turmeric iced tea, didn’t we? ;) I think I was inspired to make these bars because of that drink in the first place and I’m happy with the results. It’s a beautiful flavor for a dessert bar. I think though most of all I’m in love with that white cream layer. 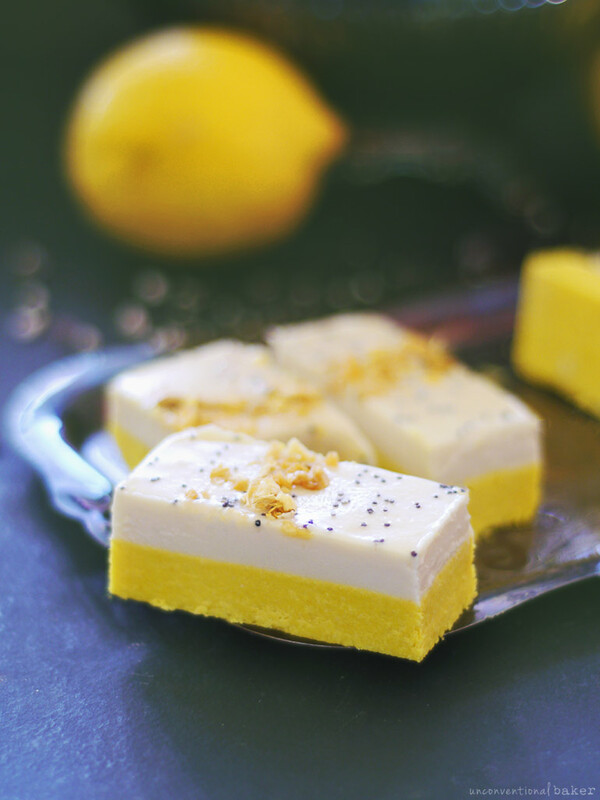 It’s delicate, fluffy, mildly lemony, lightly sweet, but so incredibly creamy. I could eat it all up with a spoon… and coupled with the tart and zingy bottom layer it’s the perfect accompaniment. The bottom layer uses coconut flour, which is incredibly liquid absorbent. That means that the moment you add the ingredients in and start to process, your mixture will thicken up A LOT. If you forget any of the ingredients and try to add them in later, they won’t blend in properly as the mixture will already be quite thick. So the lesson is: make sure you’ve got everything in that processor from the get go (I learned the hard way ;) ). Note: even though these bars are frozen they thaw out quite quickly and don’t have the feel or texture of a frozen dessert. Just throwing it out there since I know some of you mentioned you have a hard time with biting into frozen things… these bars are quite soft and creamy and ready to be eaten within 10 mins. 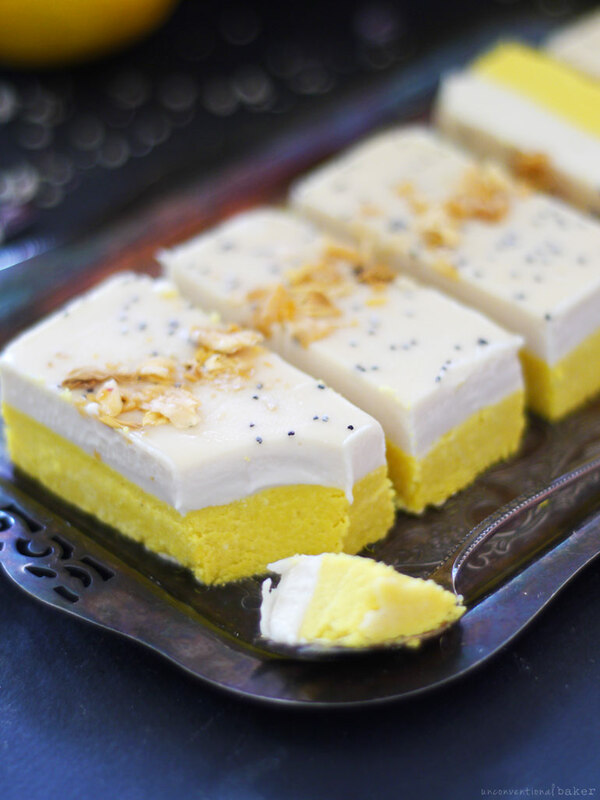 Delicious dairy-free lemon cream bars with a touch of ginger zing, and naturally derived yellow color from turmeric. Gluten-free. Process all yellow layer ingredients to combine in a food processor. Transfer this mixture into a lined tupperware container or medium-sized bread loaf pan (I used one that’s 8″ x 4″). Press down into an even layer. Cover with a small piece of parchment paper and press down once again with a flat-bottomed object to make sure that layer is smooth (I like to think of it as “ironing” :) ). Remove the parchment from the top and place the pan in the freezer while working on the next step. Clean out the food processor (so there’s no discoloration of the white layer). Process all white layer ingredients until smooth. Pour this mixture over the yellow layer in the pan. Allow to sit a minute, then sprinkle and decorate with toppings (if using). Note: if your mixture is too warmed up (very liquid), the poppy seeds might sink in a bit, so if that’s the case best to chill the pan for 15-20 mins first, then sprinkle with the toppings. Freeze for 5 hours or overnight for the bars to set. Trim off uneven edges and slice into bars and enjoy! Keep leftovers frozen. Disclaimer: this post contains affiliate links to the pineapple chips, and coconut butter I used for this recipe. I literally cannot stop looking at these pieces of heaven that you are making. Your blog is so aesthetically appealing! What an amazing job you’ve done! Hi Eni. Thank so much :) I’m glad you’re enjoying the blog and photos! 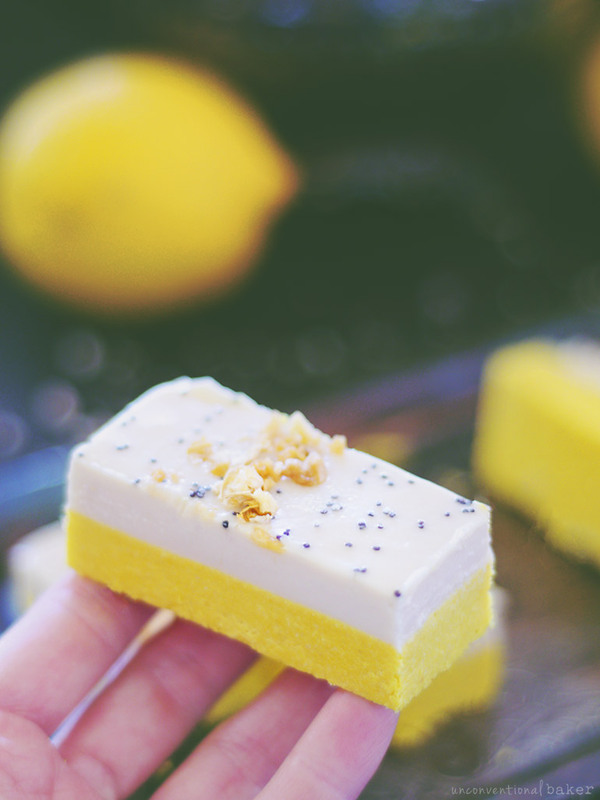 Hi Audrey I just wanted to say yummy to these lemon bars!!! I made them the other night and I was just too excited to make them that I accidentally did 1 tsp of turmeric instead of a 1/2, oops! But no biggie they were still amazing! I pretty much ate them all by myself, (except the 1 or 2 I shared with the husband because I had to be nice)! Haha. Anyways, I’ve been following you for a bit now and have made a couple of your recipes but have never commented! You are so talented and I love your beautiful photography! Thank you for all you do and for sharing your delicious recipes with us, keep doing what you do! Have a great day! Hey Audrey! These look absolutely divine, especially now that we are entering the scorching summer days! I bought a jar of coconut butter but I’m not sure if it’s the same kind you used because mine looks thinner. Coconut butter is just pure coconut blended, right? Can I substitute lemon zest for the lemon extract if I double it? Thanks! Hi Audrey, I made this cake in a round tin, with dried pineapple and strawberry topping. It turned out pretty amazing, but I notice the creamy layer becomes runny when I take the cake out of the freezer. At room temperature, the cake starts to collapse. Is this normal? Yeah, these types of treats need to be kept chilled to keep their shape, or only be thawed out briefly. The thing that’s making them hold shape is the coconut butter, coconut oil, cacao butter, and so on, and these are generally melty when the temp heats up, especially if it’s warmer where you are. 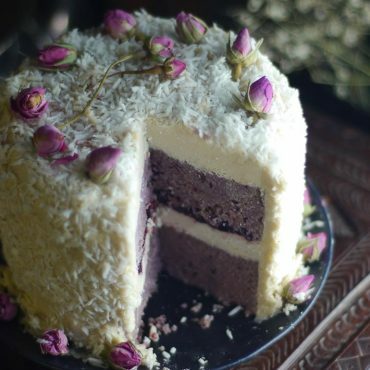 I find coconut butter keeps its shape the best / is firmest, so the cake can survive a little longer out provided it’s not boiling hot — but it only pairs with things that are chocolatey. I made a few baked cheesecakes that hold their shape well at room temp, but they’re not raw — you can find them on the blog under baked cake. They have a similar ingredient list, but the texture is room-steady. I’ve been experimenting a little with agar agar to see if it can make more room steady raw treats, but so far the results aren’t shareable :) If I make something worthy, I’ll post an update. Hi Audrey, thanks for the feedback. I’ll try something else too – create a base that goes up on the sides too. So more like a cup shape that holds the filling inside. I know that goes against cheesecake dogma ;) but it’s worth a shot. Hey Mark, oh yes — I do that for my “softer” raw cakes, like the ones that are oil-free, avocado-based, etc. It’s a good trick :) Also making them as mini cheesecakes (in cupcake pan) with the taller sides would help contain things pretty well. This is excellent and so easy to make! 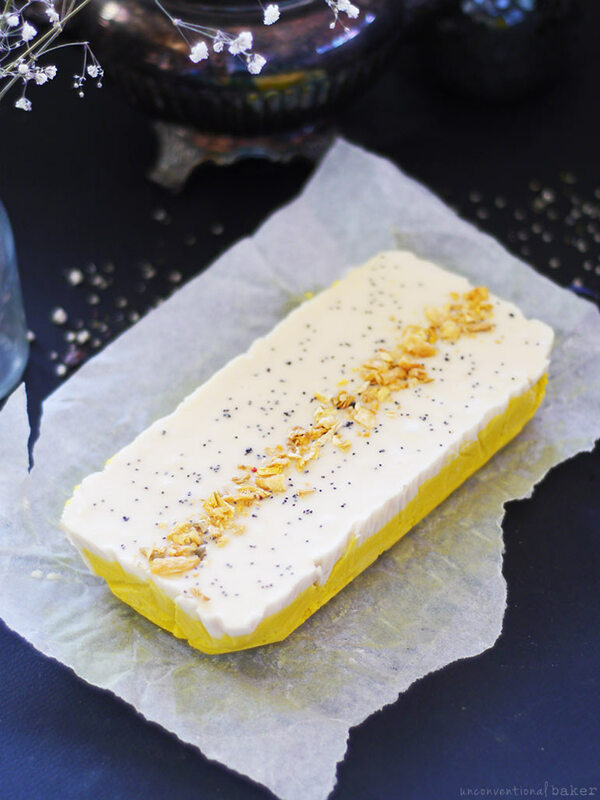 I didn’t have poppy seeds and sunflower petals so I used coconut chips and candied ginger. Thanks for yet another beautiful recipe…How you come up with all these delicious and equally beautiful creations is beyond me! I can’t wait to give these a try. However (sorry about the ‘but’ :-) , though I absolutely love coconut, my boyfriend is not such a fan. He adores lemons though, which is why I searched for lemon recipes on your site. How ‘coconutty’ would you say these taste? There is quite a bit of manna in there after all…Or do the ginger and the lemon flavor really push the coconut flavour to the background? Thank you!!! 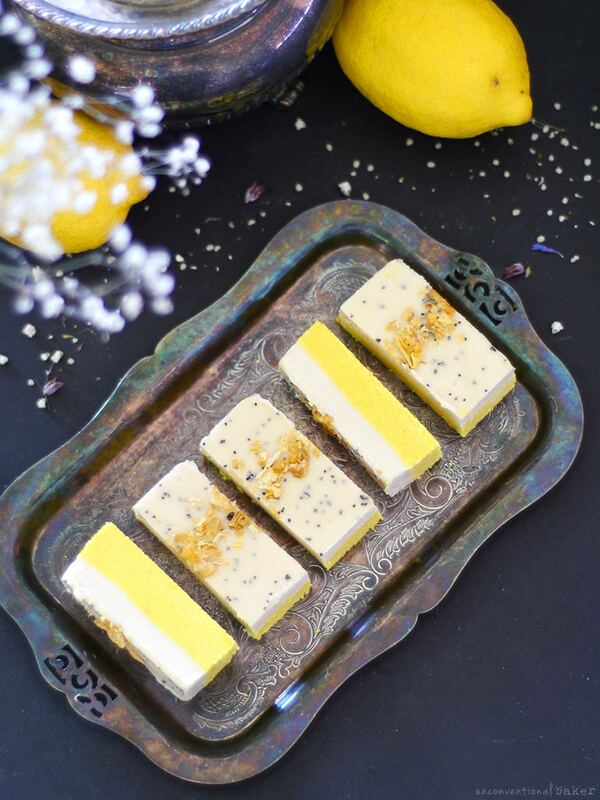 Hands down, my favorite lemon dessert on the blog is this lemon ginger chia cheesecake! I think for these bars the coconut flavor is apparent enough for a coconut disliker to not go for it (I live with one too, for the record — though he also happens to not like lemon ??). I am a fan of anything lemon! What I am not a fan of is trying to stock my fridge/cupboard with 100 different items I may use once. this sounds great but I’m not about to go out and buy “manna”. You can make your own easily in a food processor or good blender if you have shredded coconut around instead of buying it ready-made. Audrey, I made these amazing bars and was so pleased with how delicate it tasted! 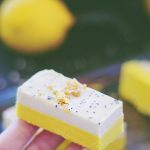 Loved the top layer and was going to eat it all straight from the food processor :) These bars are so delicious, lemony with a nice kick of ginger. Loved it. Perfect treat for the hot summer days. Thank you so much! Audrey, I’m in heaven! I made these bars and they are so delicate, delicious and with a pleasant ginger kick. I loved the top layer and how soft and amazing it is. Thank you so much for such a quick and awesome recipe! ? sorry, did this from my phone and it didnt show that it posted…my apologies for two comments. But these bars are so darn good! Wow what a gorgeous dessert! 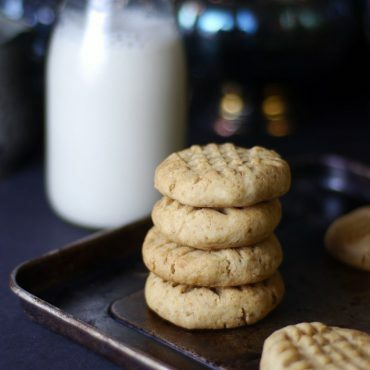 Id like to make these, do you think subbing some of the coconut butter for cacao butter would make them able to sit out at room temperature? The tea is infamous? Yikes. Whoops, good catch, Angela — it’s meant to say “famous” :) The tea certainly does not have an “infamous” reputation ? I made them last weekend! My family loved them! The only problem I had was I needed to add 1/4 cup water and 1/8 cup coconut oil to the yellow layer because it was too thick. I could only make a half batch of the cream because I ran out of coconut butter. :( Also mine didn’t hold together quite as well as yours did, but still pretty well! Overall an amazing recipe! Hi, Can I substitute maple syrup for the agave? This looks really yummy.. looking forward to trying it out! Thanks! Absolutely :) Maple is my usual go-to and it’ll work great in these. Wow! I think i found my inspiration for my future soap! yellow, creamy and containing all these coconut stuff which I love so much? Mmmm, these sound so delicious and delicate! Oh, yay! So glad :) Can’t wait to see your beautiful soap some day! These bars would certainly make my day! I love lemon products and these look and sound divine. Thanks Kari :) I agree — something about lemon desserts always evokes a smile, doesn’t it? Wow this looks so so good! I love coconut flour and coconut butter and lemon and turmeric and ginger – these were like made for me! I can make these bars pretty easily, maybe a weekend project? 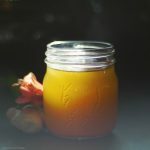 How can I use fresh ginger? I prefer its flavor. Don’t you think making the cream layer first and setting it aside, to ensure there’s no yellow, would be best? oh ok that makes sense, thank you! Hi Audrey! I made it! It was so so good! I could only make half the cream layer because i ran out of coconut butter, and I needed an additional 2 tablespoons of coconut oil and 4 tablespoons of water in the yellow layer because my mix was so dry. I also only used a quarter teaspoon of turmeric, and I got the same color you did. Everything came out very well though! My mom forbid me from eating more than one because I am sick :( but I’ll be looking forward to them when I am better! Everyone said they tasted great! Oh, yay — so happy they worked out and that you got the right color after all :) Sorry to hear you’re sick though. Tell your mom turmeric has healing properties… ?? Hope you get well soon! Thank you for the feedback. How strange — my turmeric is nothing special — just a simple organic turmeric powder, and I get it from all over the place and I always end up with vibrant yellows with just a tad of it… Maybe it’s just that whatever you’re trying it in is colored already? Even in a simple banana smoothie or nicecream, if I add just a 1/2 tsp it’s the palest yellow. It looks bright going in, but once blended it just fades away. Idk, it’s kinda an old bottle perhaps that’s it. Hmmm.. bizzare! Maybe it is because it’s old. I know when I use it in some of my cheesecakes at first the color is pale, but as it sets it becomes more and mover vibrant. 1 tsp is more than enough for a whole cake though usually. Weird, my turmeric makes things more orangey , like a mango color to everything I put it in. I think it’s got more to do with quantity. If I add a pinch to a cake = yellow, more and I end up with orange as well. Yes, just the smallest amount to make a yellow — even a pinch is enough sometimes.